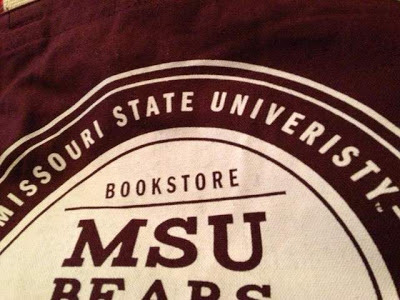 Embarrassed officials at Missouri State University (that's Missouri State University) have admitted that the MSU bookstore gave students 6,000 printed canvas book bags all containing a spelling error. For a University, it's some spelling error. According to News-Leader, the mistake was noticed by a student after only a few hundred bags had been distributed. Somewhat bizarrely though, the decision was taken to carry on handing them out until all 6,000 orders were fulfilled. Only then were the remaining 2,500 destroyed. Apparently, half the bags ordered have the correct spelling and these are due to be given out in August. MSU spent over $70,000 on the book bags but is not planning to recoup any of the cost because the original artwork for the bag, submitted by MSU, had the word misspelled, and because MSU subsequently approved a proof of the artwork sent by the printer, which also contained the misspelling. This begs the question: if a proof containing the error had been approved, how is it possible that half the bags are OK? It doesn't really explain that particular issue but, at the time, there was no Bookstore Director. Mark Brixey resigned from that position in August on the day he otherwise would have been fired, according to Paul Kincaid, MSU’s Chief of Staff. Brixey had been unable to explain to MSU auditors why $500,000 was missing from bookstore funds and why $81,000 in cash was discovered in his desk. Let's just say that he may well have been somewhat preoccupied at the time the proof was approved.